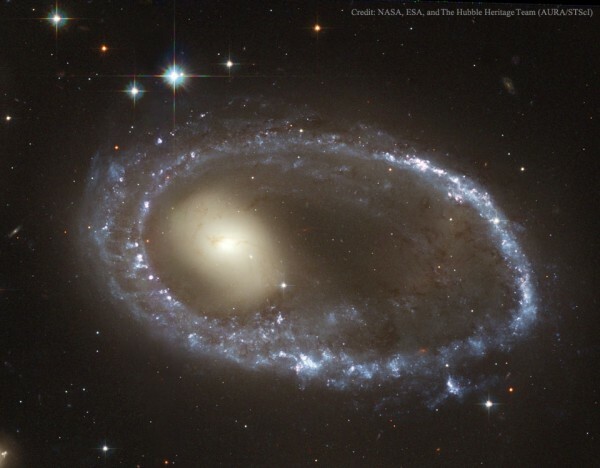 Better known as the ring galaxy (guess why) the galaxy AM 0644-741 lies about 300 million light years from here the star clusters formed after a collision with another galaxy. That is, its curious form, where the stars are located in an outer ring (yes, these are all stars) is due to collision with another galaxy. Actually, when people think of “crashing” think hitting star stars (or objects hitting things), but astronomically, things, items, when they collide, they do gravitationally. That is, there has been no collision of stars and if “pushing” gravity of the stars together. In this case, a “normal” typical galaxy that was loose out there was crossed in the middle by another undersized forcing the stars of the first to be positioned in an outer ring while pieces of the “shocking” galaxy are to be found in the center of this, that is, as the orbits are not circles, but ellipses, the center (which is one of the foci of the ellipse) are pieces of the galaxy that collided while on gravitational effects, the ellipse itself, are mixed pieces of the galaxy that collided and I crashed. Pure physical basic calculation. By the time of conservation of mass, the rest of the “shocking” galaxy is not seen in the Hubble image. And obviously, all this is still in motion, though, with our short life we ​​do not see evolve. The diameter of the ellipse is 150 thousand light years.